Embroidery Design: Butterfly 2.32" X 2.5"
What an awesome gift! 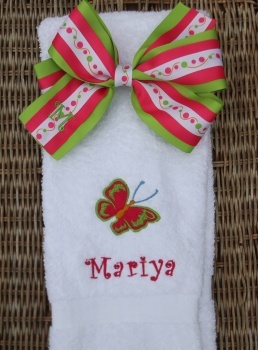 A personalized bow and hand towel that match! Any girl will love this present. 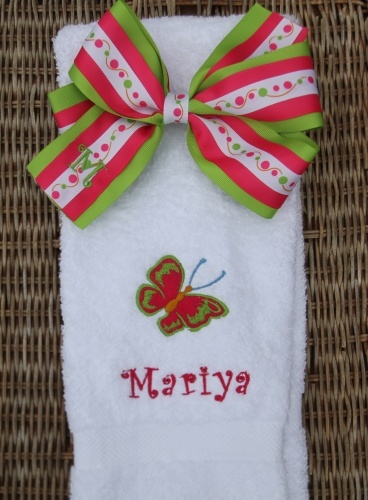 This is an embroidered hand towel that has a 4 colored butterfly design. This one is shocking pink for the wings, lime green to outline, light blue for the antennas and yellow gold for the body. The name is centered below in a matching shocking pink color in a Mono Curls font. The bow is a triple layered bow that has shocking pink, lime green, polka dots and swirls. All layers are grosgrain ribbon and the sizes are 2.25", 1.5" and 5/8". The front initial is embroidered in the same Mono Curls font and measures one inch. What a great match and the perfect touch for any special occasion gift!